Need to learn how to create a basic project timeline? Read our project management timeline guide, and try one of TeamGantt’s free timeline templates for your projects! What some people call a timeline is actually a gantt chart. What’s the difference between a timeline and the full gantt chart? 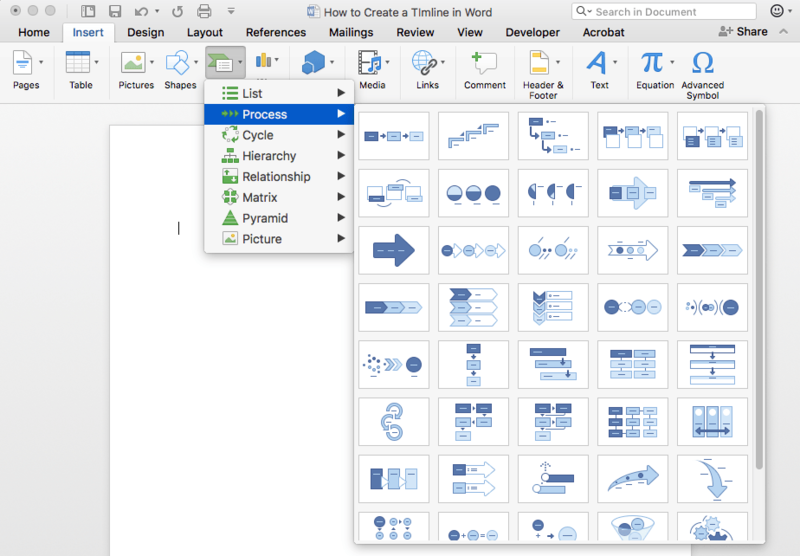 A gantt chart is packed with details about the whole project—things like dependencies, resource information, task discussions, and appropriate files and documents. A timeline is perfect for communicating high-level project information and status. If you're looking to build a gantt chart, we recommend you build one in TeamGantt. Timelines are the best way to share high-level information about your project with managers or stakeholders who don’t need all the detail a full gantt chart contains. The detailed information a full gantt chart holds is vital to the project manager and the team members and resources working on the project, but it can be too much to quickly wade through in a status meeting. That’s where your timeline shines. It’s all the pertinent data about where the project currently stands without all the extras that aren’t needed in that meeting. Your projects aren’t static entities. Things happen over time. That's' why it’s important to be able to show important dates and events visually on a timeline so others can see the full picture of your project. 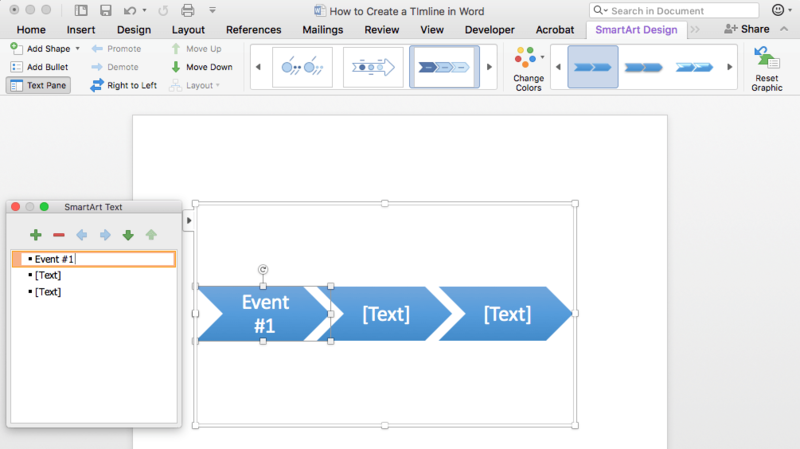 In this guide, you’ll learn how to make a timeline in Word, PowerPoint, and Excel that highlights important occasions in your projects. 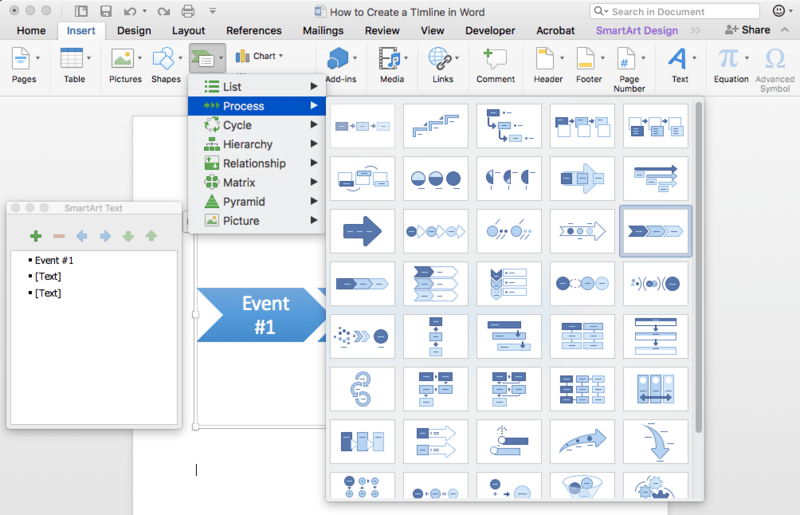 Edit the chart entries with events from your project. Break your project down into pieces. When first planning your project, breaking it down into chunks or phases is a good practice to get into whether you’re planning to use a timeline or not. Considering the steps in your project as part of a hierarchy can help you stay organized and determine task priorities. For this document, we’ll use the example of building a house. What are the main steps that have to happen to build a house from scratch? Of course, there are many smaller steps that make up each of those phases, but for a basic timeline, these will suffice. Insert the chart into your chosen application. Luckily, creating a timeline for your project is a pretty easy task once you know where to look. And the process is basically the same whether you chose to use Word, PowerPoint, or Excel to to do it. Which application you choose to create your timeline is completely up to you. There are no real benefits of one over the other as far as the timeline itself is concerned. The best option is to choose the application either you're most comfortable with or that's most commonly used by your team and project stakeholders. Once you’ve chosen the app to use, creating your timeline is easy. Start by picking a spot in your document where you want the timeline to go. Then select Insert > Smart Art, and choose a timeline from the Process section. Don’t worry too much about which one you pick right now—it can always be changed later. Edit the timeline entries with events from your project. Now that your timeline's created, it’s time to add your project events to it. Remember, this timeline is for the main phases and high-level events. You don’t need too much detail here. The event, event date, and event status are probably plenty, but every project is different. Simply click in one of the default [Text] fields in the timeline editor, and rename it to the first event in your timeline. Continue the process until all of your events are added to the timeline. For purposes of this document, we’re going to stick with high-level timeline events. For a more detailed timeline with events and event details, see one of our premade template pages. Change the visual style of your timeline. There are many different styles of timelines available to you. They all function the same, but some may be easier to read than others, depending on the amount of data in your timeline. To change timeline styles, highlight your timeline, and choose new a new design from the Smart Art > Process menu. The design will update, and your data will stay intact.